After the disappointment of the San Francisco Sourdough according to Kline, et al, it was even more of a pleasure than usual to pull this San Francisco Baking Institute Miche out of my oven. The formula was the same as that I originally posted. (Miche from SFBI Artisan II - 2 kg) I've settled on a 50/50 mix of AP and Central Milling's “Type 85” organic, unmalted flour, as first suggested by brother Glenn. This has always provided a wonderful crust and crumb and a delicious flavor. I did alter the procedure in a few ways for this bake. I mixed the dough in my Bosch (for 5 minutes) rather than by hand, and I proofed the formed loaf at room temperature for a couple hours before retarding the loaf for about 12 hours. It then finished proofing in my Brod & Taylor Folding Proofer for about 3 hours at 85 degrees F before baking. At the end of proofing, the loaf was expanded by about 75%. The “poke test” indicated it was “fully proofed, yet there was great oven spring and bloom. The crust was very crunchy after 18 hours' rest in bakers' linen. The crumb was chewy-tender, moist and cool in the mouth. The flavor was deliciously wheaty and complex with moderate sourness. What a delicious bread! That is a beautiful looking loaf. I have also had lots of success with CM's Type 85 as well, but I've been using the malted version. Just wondering why you chose the unmalted? 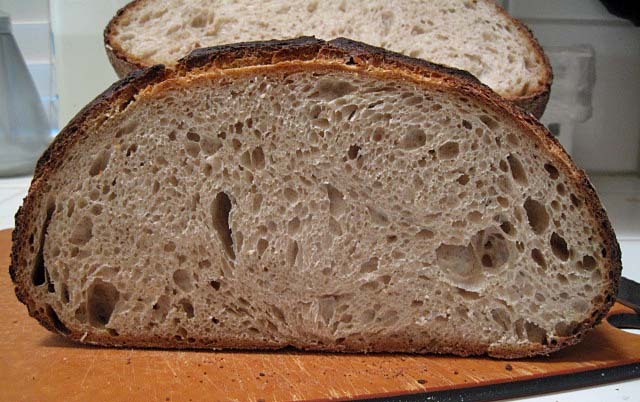 Did the warmer 85˚ final proof help to even out the density in the center (your critique of your last loaf)? My brother Glenn got the Type 85 unmalted flour at the Petaluma warehouse. Nicky Giusto must have recommended it. I don't know why. I would point out that the AP flour I used was KAF AP, which is malted. I have also used the unmalted flour alone for making miches, and they didn't seem to suffer for lack of the enzymes malt provides. Maybe Nicky gave Glenn some information regarding this choice, and he'll share it. It seems reasonable to hypothesise that the warmer environment helped with the dense center. This is a big loaf, and it is still cool to the touch after 4 hours sitting at room temperature. The center of the loaf has probably not warmed up. Perhaps at 85° F it has, and more fermentation has occurred. Nicky Giusto must have recommended it. I don't know why. I believe I procured that flour on my very first visit to Keith Giusto Baking Supply. The reason I got the unmalted Type 85 is because that's what they had available in 5 pound bags that day. Nicky also gave me a little bag of malt powder to add if I wanted to. That is a gorgeous loaf, David. I also love that bread, and need to get it back in my rotation. I remember I solved the problem of the loaves being too big for my usual use. I divided the dough into two mini-miches, and they were just as good (if not as impressive to behold). Thanks Glenn. I use the Type 85 in a number of breads as a substitute for whole wheat - it has a great flavor - and it gives a Tartine-style bread a wonderful crumb. I've been up to the warehouse a couple of times now, but haven't gotten to meet Nicky. I was last up there in November, and it looks like they are expanding their "retail" offerings with stocked shelving units in the front as you walk in. They were also willing to break open anything they had in stock and make a smaller bag (5 lb). I was able to get several types, including organic semolina and dark rye. I was there Friday and saw the retail display for the first time. They had 5 pound bags of 6 or 7 wheat flours (including Type 85) and several other grains and legumes. It's been a long time since I ordered anything unusual there; good to hear they're accommodating home bakers. Gorgeous loaf David, simply gorgeous! Just beautiful David. There is something about those large loaves that look and taste better than their smaller cousins. I became convinced in the SFBI Artisan II class that the larger miches do really taste better. The instructor talked about "the mass effect" of larger dough batches at several steps in the bread making process. I have trouble accepting things I cannot explain, but my experience attests to something real going on. That's a world class loaf, David, no doubt about it! What wonderful crumb (colour and texture) and crust (dark and flavourful) you got here. Absolutely stellar, and very inspiring! I love the color or the crumb and crust. All around delicious looking. Delicious tasting, too, I assure you! Beautiful Miche, David! Very open crumb, and lovely crust. This is a truly perfect Miche. you must be having a long serrated knife to cut the Miche so evenly. I used a Victorinox bread knife with a 10.25 inch blade. You know, it is almost long enough to handle this miche, but not quite. It's good to get back to the SFBI miche. It's been a consistently great bread for me. 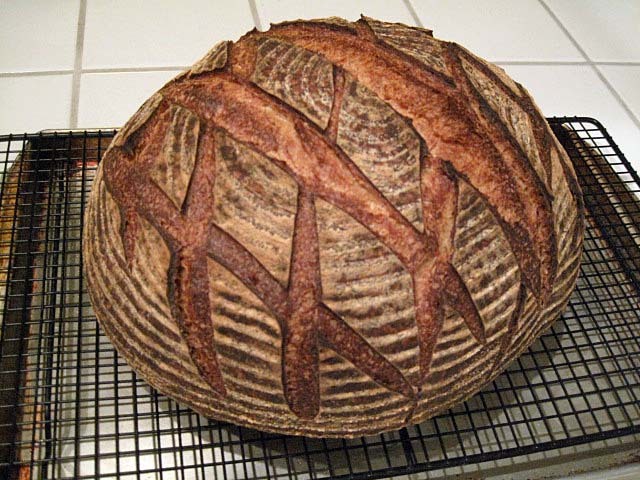 I baked your original SFBI miche formula yesterday for the first time. It was also my first time using cast iron to bake with. I baked a 2kg miche in a 10qt. dutch oven. I didn't get the exact crust result I was looking for and I have not yet sliced yet for a crumb inspection. Thanks for posting these miche formulas. As always, your posts are intersting and informative. Good to see this one revisited. And what a superb-looking miche, David! I'm one of those types who is constantly trying new breads, mostly from folk here, the rest plucked from my under-explored library of bread books. That's fine - the strategy has yielded many wonderful breads, a few ordinary ones, and a couple I marked "not worth repeating." Not to mention quite a lot of experience in different processes, which have gradually arranged themselves into the process I now use most of the time, give or take a variation or three. While trying new breads is an exciting aspect of home baking, of course I have my favourites - 5 or 6 of them - that I repeat regularly. Over time, and with the sometimes over-zealous baker perhaps distracted by all the new breads, these regular faves slowly change, one dropping out as another takes its place. This happened with your San Joaquin. For no good reason, it dropped off my regular bake list until I rediscovered it a couple of months ago. I developed a new appreciation for it on trying it again, and have baked little else since! That's highly unusual for me, but I've slowly realised that there is much to be said for baking the same bread time after time. Something gels in a way that it doesn't when you're cycling through different breads. Perhaps it's just the development of one's appreciation of the qualities of the bread. Just about everything develops in time if you give it a chance - it's all about nuance and context. If you don't stay still long enough, you never get to understand this. And the lesson needs to be learned and re-learned, at least in my case. I'd better curb this tangetial meditation and get to the bleedin' point! Which is, simply, that this post of yours has compelled me to re-investigate this bread. I recall that I loved it on the couple of occasions I baked it, but as with so many others, it faded into obscurity as I forged ahead with new bakes and regulars without pausing to look back. Time to resurrect this beauty! Thanks, Ross! I've been on the same path. For the past few months, I have also been baking my favorite few breads almost exclusively. I agree wholeheartedly with you regarding the virtues of gaining intimacy with breads through repeated bakes. My list of favorites numbers about 7, though, and provides a fair variety. There are still new challenges, of course, and there are some very good breads I have haven't made in a long time. So each weekend's list of possible bakes is always longer than my schedule permits actually baking. I'm very happy that the SJSD is providing you pleasure. That is one mighty miche, David! Beautiful bake, color, crust, crumb! Outstanding! Wow! A near perfect bake! Thank you, David, for posting this wonderful miche. I have a bag of 2 kg of T80, a french organic flour (brand France Nature) and I must use it asap. Your miche is the answer to my dilema "what to do with that flour?" I'll do my best to get a result as good as yours. That will be a very dificult task, cause your miche is perfect. Your T80 flour should make a delicious miche. Let us know if you make one with it and how it turns out. Beautiful! The Miche is still one I have to try. I just got a Bosch mixer, & noticed that you mixed in yours for 5 minutes. From what I read, this should get to an intermediate mix. Would you share what you have learned about your mixer, please? david, I made it this weekend. I didn't use the T80, because I found a bag of T110 that expired in january 2012 and I decided to use that, I sifted it and I removed the large brans. I didn't used the wheat germs, and I kneaded by hand, I made 1100 g of dough and I tweaked the formula as follows (to fit my schedule in a busy day): after the first fermetation (3:30 hours at room temperature, with 3 folds in the bowl in the first 1:30 hour, then with S-F at 45 min interval) I realised it was too late in the evening, and I didn't felt like shaping and cleaning afterwards... so I placed the dough in the fridge for 10 hours. The next morning I removed it, let sit 1 hour at room temperature, preshaped it, shaped it in a round boule, proofed it for 2:30 and baked it. It was a little bit underproofed, I should have left it proof another 20-30 minute, but it was hard to estimate at that moment. This bread is fabulous! It's one of the best I've made recently, and I think I usualy make good bread. 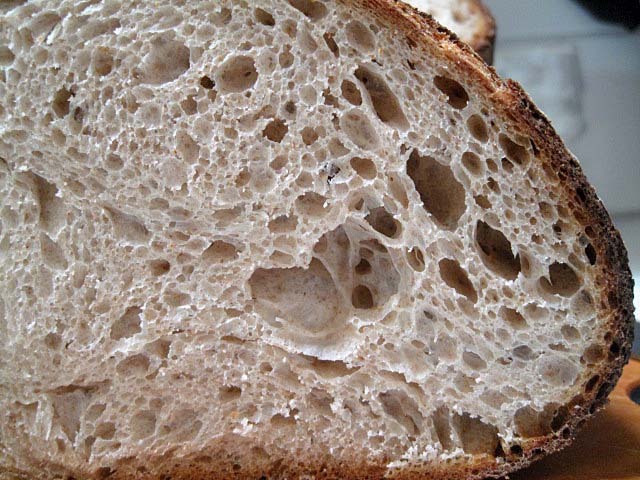 The taste gets better after a day or two, and the texture of the crumb is elastic, cool and chewy! I'm a happy baker! I'll put some pictures this week, when I'll have time to blog about it. ps 1. This method of retarding the dough before shaping it's something I first did (by mistake) two weeks ago with a Vermont Sourdough (the one with whole wheat from hamelman's book), and repeat it again, last week, with 25% whole-wheat Vermont. I'm impressed with the result. 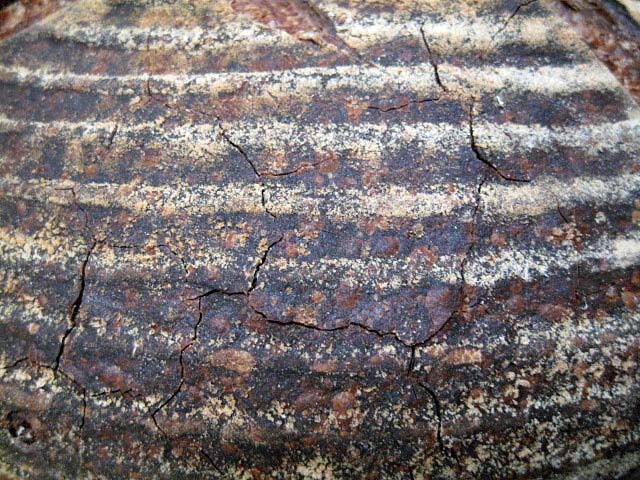 Very nice dough texture, a pleasure to work with. Maybe you'll like to try it. ps 2 . I made your san joaquin many times in the last year. You can see my results (incredible amount of pictures :) on my romanian blog, link here (I don't know if I'll have time to post about it on TFL). I'm delighted you are enjoying these formulas. A $10 loaf this time because of its size and beauty. Another fine peice of work. Beautiful photos too. Late comment/query on an oldie-but-goodie post of yours: This 2k miche was clearly proofed in a cane brotform, not a linen-lined banneton. As a miche afficianado, I wouldn't mind having a brotform proofing option. The only round one I've seen on the market big enough to handle 2k of dough is a 30x8.5cm cane round from Masterproofing (China). Can you share the source of yours? This is what I use for large rye loaves as well as miches.